Brisket can be an illusive beast. It isn’t as forgiving as pork shoulders or ribs but fear not! 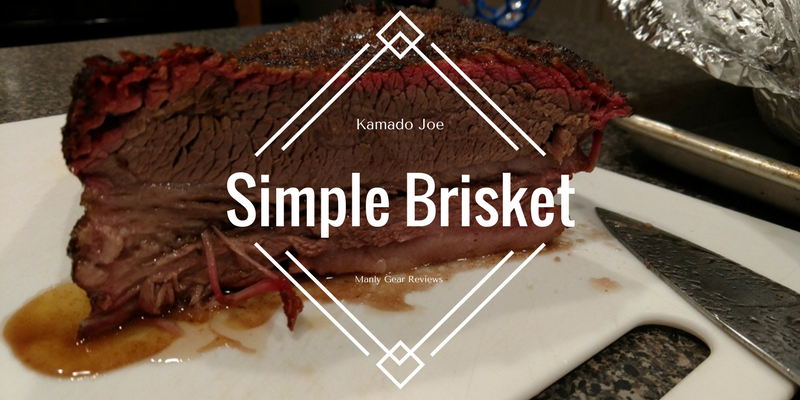 Follow this simple method of cooking a brisket on a Kamado Joe and you will be good to go. When I say simple I mean simple. Lets get started. Boom! Thats it! Lets get the prep work done. 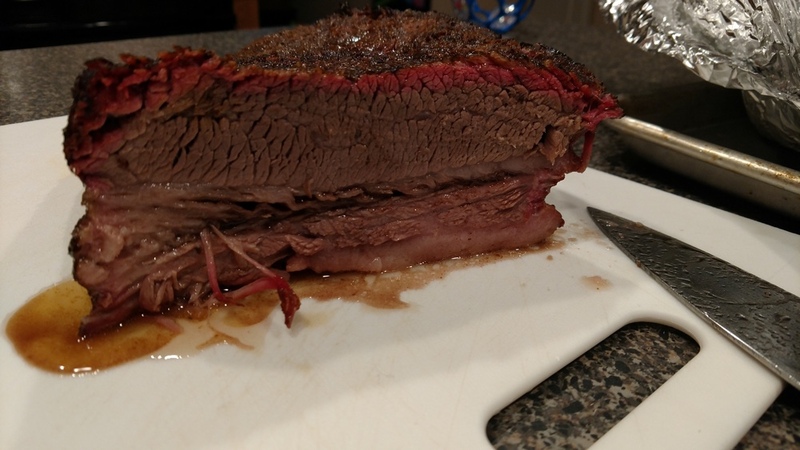 We treated ourselves with a USDA Prime 15 pound full packer brisket from Costco for this cook. Start off by removing big chunks of silver skin. Other than that you can trim off the large chunks of fat or leave the whole thing as is. Totally up to you. I personally prefer to trim the huge chunks and leave about 1/2″ or less in other spots. After you’re done trimming go ahead and put some binder on all sides (olive oil). I usually go the ‘Franklin’ method and just do salt and pepper but today we used Plowboys Yardbird Rub. I personally don’t go nuts on how much rub I put on but its up to you. When you are done with the rub let it sit a minute on each side before turning it. That way the rub doesn’t just fall off. 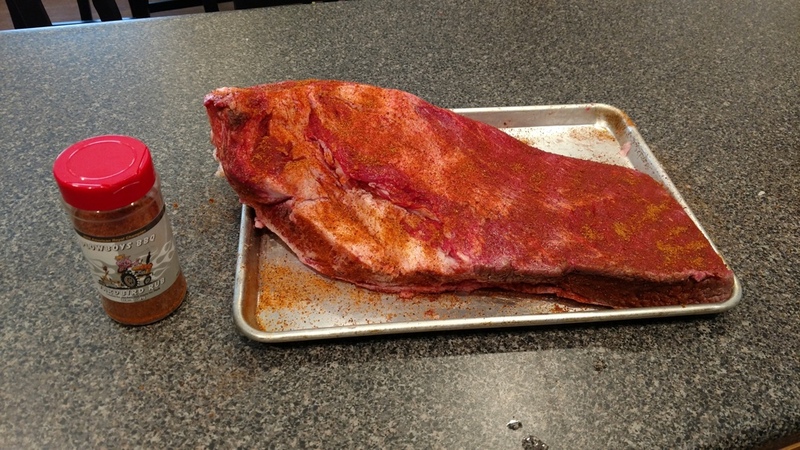 Since brisket is beef, go ahead and let it sit on the counter while we get the Kamado setup and started. If we were doing pork or chicken it would go back in the fridge. I’m not going to go into how to start your Kamado as there are 100’s of videos out there on how to do that. Just light it as you normally would. Throw a couple chunks of your favorite wood in there if you want as well. You’re going to want to use both diffuser plates and obviously both racks on top. 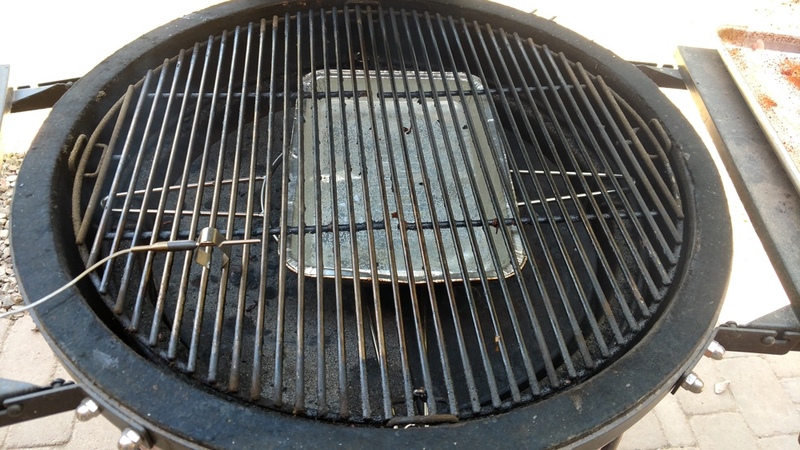 I know lots of people say you don’t need a water pan in Kamado style cookers but I personally think it works out better. Notice the water pan is not directly on the ceramic heat diffusers, use that wok holder deal so the water pan isn’t directly on the diffuser. If you have a grate probe now is a good time to set it up. 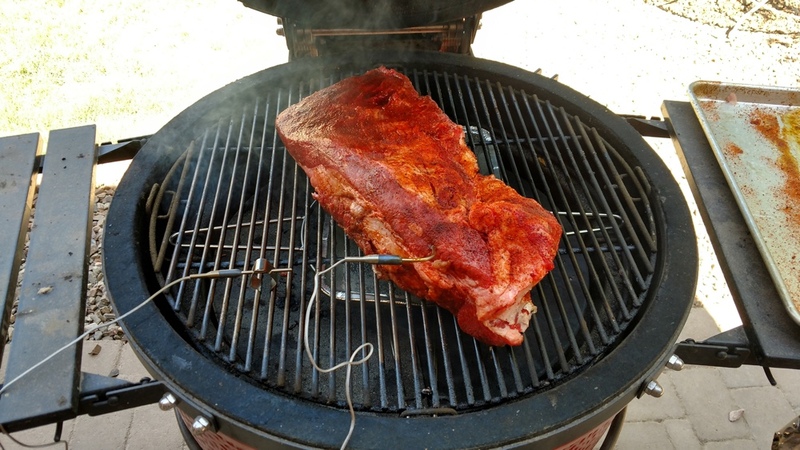 I’m also using a Thermoworks smoke for this cook. These are not required but they are a nice tool for knowing exact temperatures. Now bring the temperature up SLOW. I’m going to try 225 on this cook but have had success going all the way to 300. 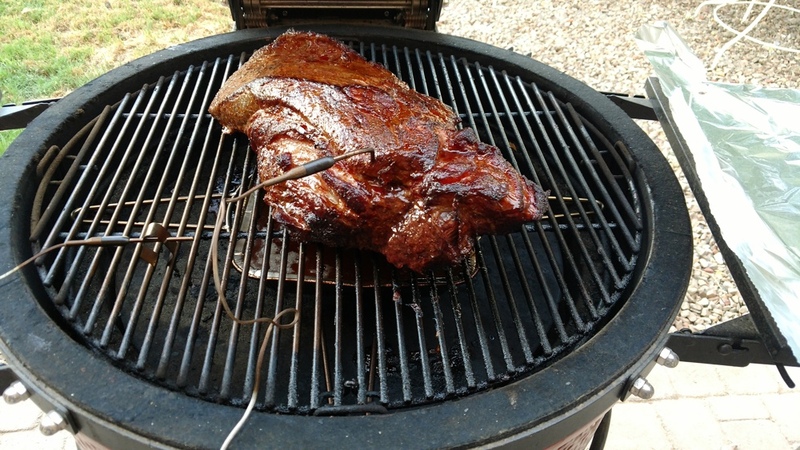 This brisket has obviously been on the smoker for a couple hours, just wanted to show probe and meat placement. It’s not barked up as much as usual but we have hit “the stall”. This usually happens around 155-165. You know its happening when your meat doesn’t increase in temperature for 20-30 min. Time to cut our losses and wrap this puppy up. Use heavy duty foil and wrap multiple times. Oh yeah, wrap it TIGHT! You can just leave it and muscle through the stall if you want, I prefer to wrap it at this point though. Back on the smoker all wrapped up. Lost about 2 degrees but we’ll recover. Notice I have the meat alarm set to 195. 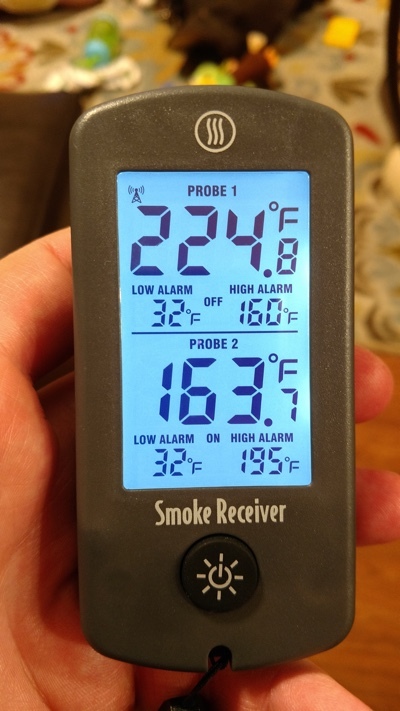 Never had a brisket probe “done” before that so figured that was a safe place to check. 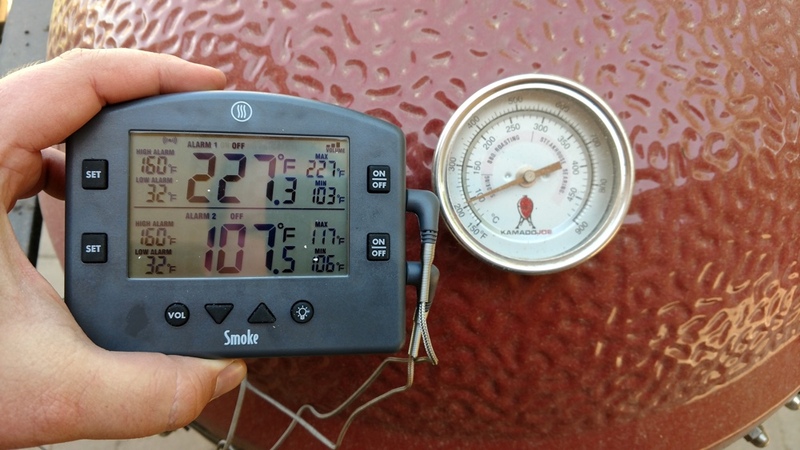 Quick note on how to know when your brisket is done: This isn’t a steak where you can cook to that perfect temperature every single time and have a great piece of meat. 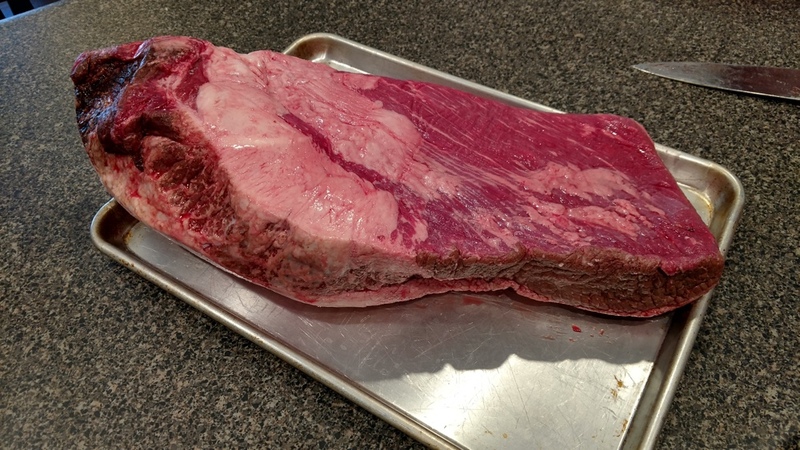 With brisket you are going to have a window between 195-205 degrees (maybe more but rarely) when that cut is going to be done. How you tell is very simple: Check tenderness. Just grab your instant read temperature probe and poke through the meat in various spots. It should glide through. Make sure not to poke out the bottom side of the tinfoil if you wrapped. When it feels tender, pull it and let it rest for an hour minimum. The fruits of our labor. Sorry for the dim picture but as you can tell this thing has a fantastic smoke ring and is crazy juicy. Yes, it tasted as good as it looks. daaang! This looks delicious! I’m grilling out this weekend for my little girls birthday but we aren’t having a 15lbs brisket like that. Although, it’s a little to red/pink for me but I can almost smell it through my computer screen and it’s making me hungry. Great info! Thanks. Probably a dumb question but I’m guessing there is water in the water pan, not just a drip pan? People will do it both ways but I prefer water in the pan.